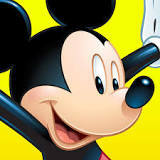 Should Independents Boycott Disney for Supporting ABC News that is just Leftist? The press has really become a total disgrace. The press conference of Trump was fairly straight forward and he took questions from even some of the worst of the worst like CNN. The journalists will not stop. I watched the reviews of ABC news to see if George Stephanopoulos would be just neutral – no way! Stephanopouls’ wife, Ali Wentworth, is one of the people who said they would leave America if Trump won and this guy is in charge of news at ABC? These people think they are so important that if they left the USA the nation would crumble without them. Please, if you are short of money, I will buy your one-way ticket. 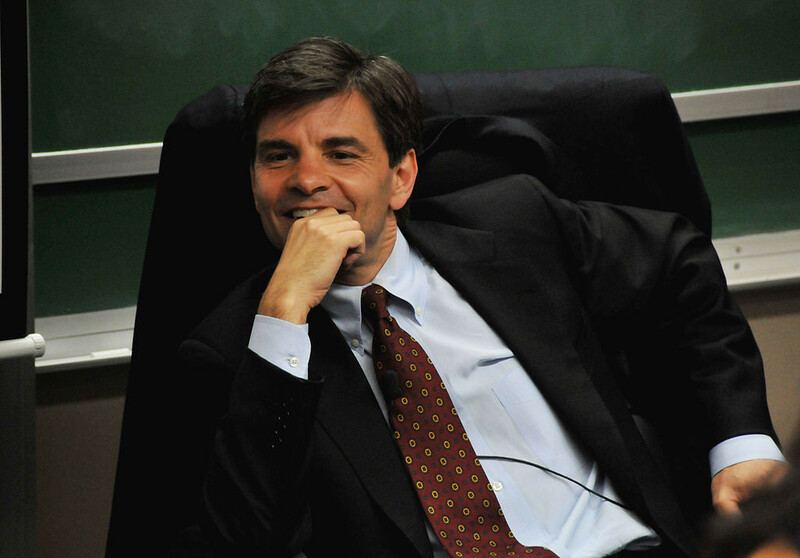 George Stephanopoulos worked in the White House for Bill Clinton and was White House Communications Director. ABC has this guy as their Chief Anchor and the Chief Political Correspondent? Come on. Stephanopoulos accuses Trump of not respecting judges. If this were a court of law, Stephanopoulos would have to recuse himself form commenting on anything to do with Trump since he worked for the Clintons. ABC has indeed become FAKE NEWS – a far cry from the respected Peter Jennings days. My advice to Trump – make press conferences like that at night so the people can see it unfiltered by the press who will twist everything to negative. Trump tried to make it clear that getting along with Russia would be a “good thing” but the press sees it as their savior, Hillary, lost because of Putin and they want war. I say give people like Stephanopoulos and his wife a gun and stick them in the front line of an invasion. If Trump tries to lower tensions with Russia and China, they will be all over him demanding war and claim he owes Putin. It is really astounding how world peace is no longer in fashion and they want Trump to start some war with Russia. This is really just beyond belief. This is the goal of Disney who owns ABC? I think Walt Disney himself would be outraged at the conduct of ABC News and how it really spews out anti-American philosophy and supports only the Democrats to the point of finding only criticism of anything Trump does ever! This is not the wholesome image of Disney and how they are supposed to be unbiased for children. You have to wonder if it;s OK for Democrats to boycott stores that sell Trump’s daughter’s cloths, then is it OK for Trump supporters to boycott Disneyland? The comedian Sarah Silverman, who spoke at the DNC National Convention for Hillary, tweeted that her 10 million followers should “wake up & join the resistance” to President Donald Trump. She said: “Once the military is w/us fascists get overthrown. Mad king & his handlers go bye bye.” More and more people are trying to instigate a military coup. Our model was forecasting this to be the biggest spike in civil unrest in history. I am not optimistic about what unfolds moving forward. So Democrats want a military coup and overturning the Constitution? This is getting really nuts! The emails that I get from the crazy left are full of nothing but hatred yet they claim to hate Trump because of his hate speech. One wrote: “Trump is already hated and despised on day 1, imagine what Americans will think of him when he fails to accomplish his goals? You are a fool, this is common sense stuff.” When you read what these people write with such hatred, it is not hard to see where we are headed and why. By 2032, the other side of that turning point looks to be a serious risk of total chaos in the West, and the financial capital of the world will move to Asia. Keep in mind that Asia is NOT PART OF the bail-ins that governments in the West have signed into law. 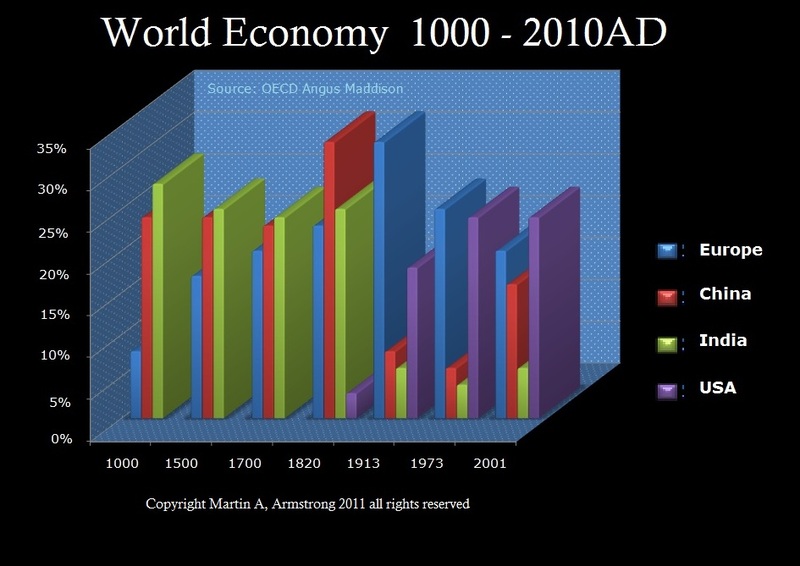 Asia is void of the real structural flaws that are going to cause the collapse of the United States and Europe. These people stirring up the protests do not realize that they cannot simply overthrow Trump and everything will be OK. This will lead to unimaginable confrontation and history provides a guide to how the military will itself split. 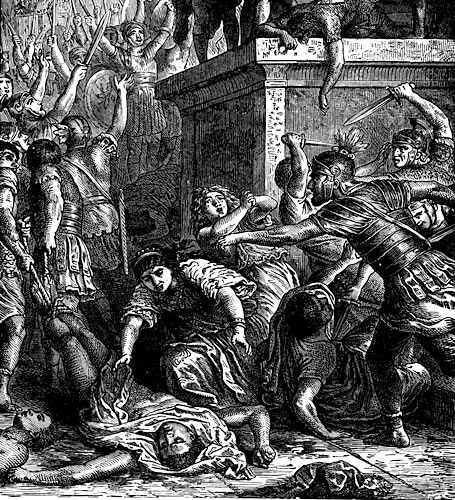 During the Nika Revolt, the angry mob began shouting insults at the emperor and began to assault the palace. The palace fell under virtual siege for 5 days and people were fed up with the high taxes and the government like we see today. The mob set fires that began to spread and much of the city now was engulfed in the flames as they have done recently setting fires to various things. The local police and military troops would not suppress the mob and then some of the Senators called for the overthrow of the emperor. The troops would not defend the emperor. Fortunately, one legion was stationed outside the capital. They were not composed of local Greeks so they had no problem killing Greeks. They came to the aid of the Emperor, entered the city, and killed all the protesters. What is going on is very similar to the Nika Revolt. Asking the military to overthrow Trump is just totally insane. These people have absolutely no concept of what they would unleash. The military will split and we will have troops fighting troops on American soil as we saw in the decline of the Roman Empire. Anyone who thinks they can overthrow Trump and that will end everything, they are out of the mind. This will be just the beginning of the end. History does repeat.